The Kershaw Whiplash is certainly an intriguing idea and does have some good things going for it, but it's an unusual concept not everyone will love. The Kershaw Whiplash is a full tang fixed blade, but your first thought when you see it might be that it folds. In order to neatly store the parachute cord wrist loop in the handle, the finger choil cuts through two thirds of the knife's tang. Doubts about the strength of that notch place this knife in the cutting category, not the pry bar category. Consider it light duty, because the only way you'll know the strength of an individual Kershaw Whiplash is to break it. As a light duty knife, it packs considerable clout into a light six ounces and a durable nylon belt sheath. Where knife retention is a real concern, that trick with the wrist lanyard could be very handy. One of the primary reasons for not using a lanyard is the likelihood of that loop being caught on brush or gear. If you're moving fast you may not even notice the tug. The cord on the Whiplash wraps neatly around the grip lengthwise, snapping into place with a lever lock. To release it, flip the lever open and let the retaining ring fall free. With practice, that might become a one-handed procedure, but don't count on it. You'll likely need both hands to put the wrist loop into use safely. It's certainly a stouter knife than most climbers and ultra-light travelers usually carry with features useful for both types of user. 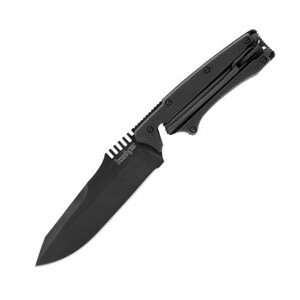 The military-style blade of the 9-inch Kershaw Whiplash includes an anti-glare titanium nitride coating and deep ridges cut into the spine of the blade for extra thumb traction. Hardened to Rockwell 58-59, the cutting edge of the 8CR13 stainless steel blade holds a durable razor-sharp edge. Grip construction is solid enough, built with handle slabs of glass-filled nylon with high-friction textured surfaces. The Whiplash might be just the knife you need.